WV: How did you initially become involved in boxing, and what do you enjoy about it? I first started training properly at about ten years old when my dad opened his own boxing club, but I had been around the sport since I was six when my older brother started. I used to go with them to the training sessions and I really enjoyed watching them. I enjoy boxing because it has given me a healthy and great life style, I love the sense of achievement when winning fights knowing all the hard work has paid off and making my myself, family and friends proud. Also, I love the fact that I have so much opportunity to travel and see parts of so many different countries when we go abroad to tournaments. WV: What was training camp like for you coming up to the Euros, how long was your training camp, and what did an average day involve? My training camp for the euros was a bit more intensive this year due to it being my first year competing over 3×3 minute rounds. I’m always in the gym training and working to keep fit and in good condition, but with about eight weeks to go we start to pick up the harder training and really concentrate on bringing my fitness right up to scratch. Beginning with early morning runs and hard sprints, after a week or two of getting my fitness better I’ll then start travelling around getting plenty of hard rounds sparing with some top senior females and some top pro boxers as well. Anywhere from 3-10 round spars, an average day of training involved a 3/4 mile run or some intense sprints at 5:45 am, at around dinner time I would then go to the gym and do a steady and light technical pad session or maybe a strength and conditioning session with my strength and conditioning coach. 6pm I would go to the boxing club and join in with our club boxing session where we’ll do a variety of things from bag work, footwork, circuits and different drills. WV: How long have you been involved with the England squad, and how did you get selected? I have been involved with the England team for a bit over three years now, to get selected I was asked to go to Warrington for a three-day training camp with loads of other girls they were looking at taking on. I was then asked to go to the institute of sport for a couple of weeks after for an assessment. Since then I have been put on the England program. I have managed to work my way up the ranks and excel at the highest level. WV: Congratulations on getting gold medal at the European Youth and Junior Championships!!! Could you tell us who you had to fight, and how the tournament went down in your eyes? My tournament started with a pre-quarter final against a Hungarian girl who I beat by the referee stopping the contest in the first round. In the quarter finals I boxed the Italian home girl who I beat on a unanimous decision. 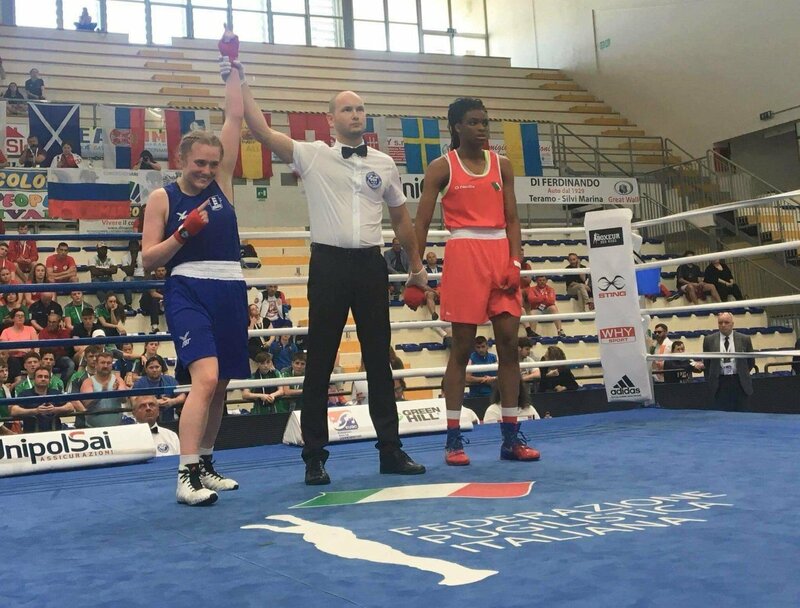 In the semi-finals I beat the Russian champion also by unanimous decision and faced the Irish champion in the final where I took my second gold medal at the European championships and gave her two standing eight counts on the way. The tournament went really great in my eyes and I feel like from a personal side I performed really well winning three of my four fights by unanimous decision, and one by the referee’s decision, it was also a great medal tally across the whole of team England. WV: What are your future plans? Are you planning to make the GB team for the Olympics? And for the readers could you explain to us the step up from England Boxing to the GB team? WV: Are you looking for sponsors out there for your career? And if you are how could they get in touch with you? We’re always looking for sponsorship because it can be an expensive sport with my training fees, training equipment and travel costs to travel around the UK and abroad for sparring and training camps. If there is anyone out there that would be interested in sponsoring you can contact my coach by email on a_ricko75@sky.com or England boxing, any contribution is greatly appreciated. WV: Who are your coaches, and could you tell us more about England Boxing? My main coach is my dad who does the most part of my training and, also my older brother who sorts out my fitness, takes me out in the mornings, does my runs and sprints with me. I’m also lucky enough to have a big and very good team of coaches who all coach the session at the boxing club on a night where 90% of my training is done for tournaments. I also have a strength and conditioning coach who works with me twice a week, on the run up to tournaments we then have residential camps with England boxing. WV: Do you think boxing should be part of the national curriculum in schools? I think it would be a great idea especially for the fitness side. I have spent some time coaching in junior and senior schools over the past few years and it has always been received warmly and it gives a good insight into how hard it is to train in boxing. Boxing can be used in a positive way to help with discipline and channelling energy. And maybe in the future they could even have inter school boxing tournaments. Boxing can change lives in so many ways from just using it as fitness to maybe one day competing. There is a place for everyone of any age, race or gender. And the boxing gyms are the friendliest places with a real team feeling. On a personal note even though women’s boxing is on the up and has improved over the years there is still people that see it as only a male sport. I hope one day that everyone just sees a boxer because we all train the same way.